I grew ip listening to country music - I have always loved country and probably always will. But lately, it seems that more of the songwriters and artists are including what we would call "four letter words" into what are otherwise good songs. This has been bothering me for a while. Especially this past week while hearing what is otherwise a great song - except they had to go and put the "d---" word in it. Didn't add to the song and made it one I don't want the kids to go around saying to their friends. There will be a "clean" country undertone to Big D Country. With the kids back around the studios, I realized that I was having to turn the monitors down. By Monday, a good bit of the playlist will be different. There are plenty of positive country songs out there. I'm fine with real life, my-woman-left-me songs if it can be done without cursing and delving into lyrics that I don't want the kids singing. I know that a lot of country artists have a relationship with Christ. Careers, ratings and managers don't always allow for every song to be "positive." My personal confession: I used to work in, and listen to, Christian radio. Especially in the 1980s, contemporary Christian music was another genre I really enjoyed. Today's K-Love and rock/edgy praise and worship songs just don't really do anything for me. In the car, the choice becomes talk radio or K-Love. Given those choices, I've started taking my own mp3 player to listen to what I want. Big D Country will be continuing playing country and classic country. You won't even notice a big change. But as a Christian-owned station, there will be a positive change. You can hear the difference - because we want to make a difference! What is your favorite classic country song? I am looking for some listener input here. What are some of your favorite classic country songs and artists? I'm asking because I want to be sure we are providing you with the best content possible. For the past couple of weeks I have been looking for a few "forgotten" classic country songs - that is, songs that even classic country stations don't play that much. So if there's a song you think we're missing, drop me a line or comment here on the blog. 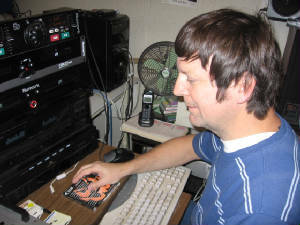 One of the goals I had upon starting the station was to provide quality programming, including songs that are not heard often on radio these days. My commitment to that goal remains as strong as ever. This week, there are a couple of minor programming tweaks I wanted to let you know about. First, I am actively looking for some additional "lost" country oldies all the time. This week, I managed to acquire about 15 of these songs. So feel free to send me any requests you may have. If I can find it, I'll get it on the air, most of the time! The goal is to build Big D Country into "a country music lover's dream station." Along these same lines, one of our neighbors is planning to donate some albums to the station this month. I don't have any idea what is in their collection! Secondly, I've cut down some of the time (about 1 minute) from the Information Updates. Reading the same road closures over and over is a bit much to do four times a day, so along with the accidents, I'll only cover a few of those within each info break. As always, major traffic information will be posted on our Facebook page. I've gotten a little - not a lot - of feedback from the Radio World story. I did walk a few station owners through some of the details of how to stream their stations. Thank you for listening to, and supporting, Big D Country.